All credit to Acer - gaming chairs are usually designed within very similar moulds, but you can hardly say that's the case with their very latest concept. Unveiled today at IFA in Berlin alongside hardware galore was the 'Thronos', a gaming throne that turns the usual dials up to eleven. The Acer Thronos is a lot to take in a first glance. Clearly it has more in common with the driving sim seats that sometimes pop up in bespoke builds than standard chairs, but with a far more 'finished' closed-frame look. A central triple-monitor mount arcs over your head for a full wide display, and it can accommodate displays up to 27" in size. 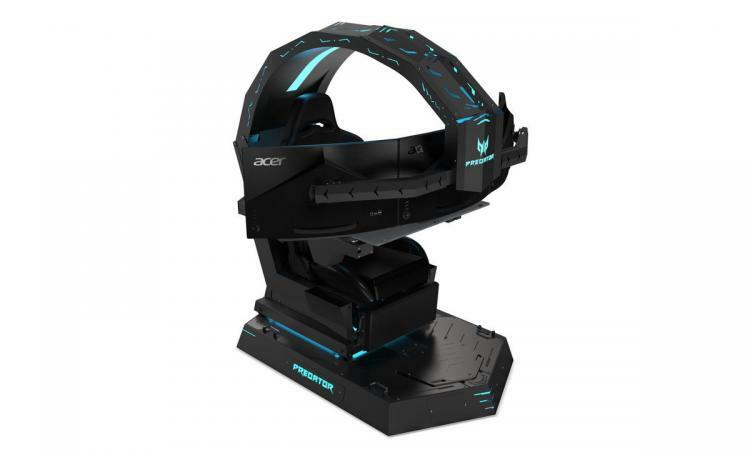 That's great for immersion, especially if they feature frame-syncing technology such as the Acer Predator monitor lines with G-Sync and FreeSync. The frame itself is constructed from steel, giving it a rigidity more than a little necessary for active gaming sessions. Unlike driving simulator seats however the Thronos has a surface to sit keyboard and mouse between the two extended arms, while the unit as a whole can tilt backwards up to 50 degrees from the vertical for your perfect gaming position. A foot rest is, of course, also integrated into the chair. Weighing in at approx 225kgs, the Thronos is an extremely hefty piece of kit that's clearly for enthusiasts only. Pricing and availability hasn't been revealed as yet, but it will definitely not be coming cheap. You can check out more of Acer's IFA hardware reveal - including laptops, monitors, peripherals and more - at https://www.acer.com/ac/en/GB/content/nextatacer-berlin-2018.